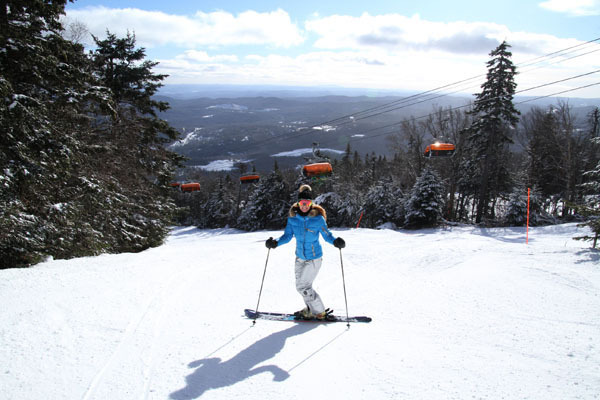 Top 10 Reason We love to ski at Okemo Mountain Resort in Vermont! The Snow – Okemo makes tons of it – literally. 98% of Okemo’ Mountain’s 667 ski-able acres is covered by manmade snow, the highest percentage in Vermont. With 1,300 modern HKD tower guns, Okemo blows away the competition when it comes to blanketing terrain in white.. Killington and Mount Snow are 80% by comparison. Okemo opens a lot of terrain, early. This is our go to place in early December for reliable snow, often our first family ski trip of the season. 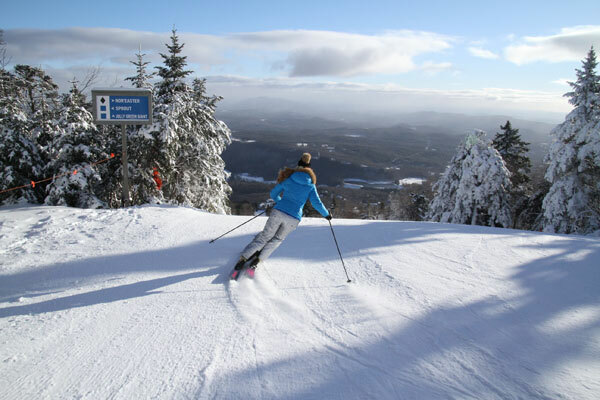 The Beauty – Okemo is nestled in Ludlow Valley, offering pastoral and mountain views at every turn. There’s something magical about the Green Mountain State blanketed in white. The Sunrises – Okemo’s orientation lets the sun light up the trails splendidly each morning as the chairs start moving up the high speed cable lift lines. The Terrain – Okemo rhymes with hero because their moderately pitched trails help you ski well. Dream Weaver, Jolly Green Giant, Sapphire, Heaven Gates are all beautiful long rolling trails, never too steep or intimidating. Even the Black Diamond World Cup, Chief, and Limelight are manageable, and enjoyable for most, as they are typically well-covered and well-groomed white carpet. Early Openings – Weekends and holidays at Okemo you can board lifts at 8am. This is a very special time of day, early to the slopes. As the orange sun sparkles on the corduroy groomed trails, its you, the liftees, patrol, and a few hearty souls. You ride the mountain in orange bubble-covered leather heated-seat comfort back up to ski another lap. Let the rest hit the snooze while you cruise. At Okemo – the early bird gets the turns. The Food – Most ski areas have an F&B dept, for basic food and bev at not so basic prices. The Culinary team at Okemos serves some of the best ski area dining anywhere, with themed restaurants all around the mountain, delicious local-sourced creative cuisine. Epic’s Pho steamy noodle bowl with Ahi Tuna is extraordinaire. Coleman Brook Tavern has rich leather furnishing and an equally lavish menu, plus a cork snob’s wine list. The Vermont barn style Roundhouse Café round out their offerings with cafe styel food and an Okemo Tap House. The Parks – Okemo pushes the park envelope – one of few ski resorts still laying out the Benjamin’s for a superpipe, plus several dedicated terrain park trails. Snow Park technologies designs Okemo’s trend setting parks and they are progressive, well-groomed and maintained, with good vibe among the parksters. The People – They call it the “Okemo Difference” and it shows in the smiles and can-do attitude of every team player, not to be confused with mere staffers, at Okemo. “Employees” feel vested, important and appreciated, even through the transition from family owned by the Muellers to Vail Resorts. I challenge you to find a friendlier mountain – top to bottom. The Kids – Okemo has long been among the best in New England for learn to ski and ride kids programs. From Penguin Playcare to Mini Stars, Snow Stars, then Mountain Explorers and Amplitude Plus for 7-14 year olds wanting to go bigger and better, Okemo has well-oiled instruction programs guised as “fun” for your kids. As a mom, I trusted these ski instruction programs for my two lil’ skiers, and I especially loved Kids’ Night Out…for the obvious parents’ night perks. The Condos – Ok, Okemo has a tons of condos, and they’re building more. But we all want to stay slopeside, right? Okemo has great ski in ski out location whether you choose to be central at the original Okemo village, the northern most full service condo-hotel Jackson Gore Inn, in between at WinterPlace or Solitude, or the new South Face Village. Okemo ski and stay packages include lodging with the comforts of home, lift tickets, plus access to indoor heated swimming pools and hot tubs for après ski. 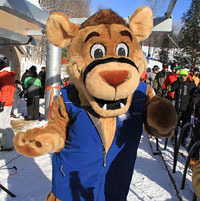 The Après Ski – Okemo has the Timber Ripper Mountain Coaster, Snow Tubing and Fat Bikes for family après ski activity, plus the Spring House for swimming and the Ice House covered rink for skating. For (ahem) the best adult après ski with libation, there’s Tom’s Loft Tavern– a lively casual locals bar by the Clock Tower, and Sitting Bull for Macho Nachos and live music with a slope view, the Coleman Lobby Bar for more sophisticated fireside martinis and s’mores if the kids are tagging along or you’re staying at Jackson Gore Inn, and finally The Killarney down the mountain road for a classic Irish Pub with local IPAs on pour. Now that Okemo is “Epic” with the 2018 Vail Resorts acquisition of Okemo, Mount Sunapee and Crested Butte, it’s on the Epic Pass… another reason to love Okemo!